HISTORICAL CEBU. A stay in Cebu is not complete without stopping by a few historical landmarks. The Spanish expedition, headed by Ferdinand Magellan, first landed in Cebu in 1521 on its quest to colonize the Philippines. 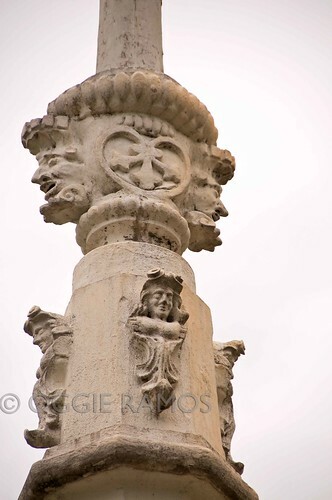 Magellan’s wooden cross still stands on Magallanes St., Downtown, beside the Basilica Minore del Santo Niño. Ferdinand Magellan planted the cross to commemorate the baptism of local chief Rajah Humabon and his wife and their people in April 21, 1521. The original cross is safely contained inside the tindalo wood outer casing to protect it from people who chip away at it, believing it to be miraculous. The Basilica Minore del Santo Niño was built on the spot where a statue of the child Jesus – believed to have been brought by the Spaniards during the 1521 expedition – was found by the Spaniards in 1565. The church, ran by the Agustinians, was first built out of wood and nipa in 1566 and later on constructed out of hard stone in 1735. The church’s museum traces the history of Christianity in Cebu. Colon Street in Downtown, Cebu is the country’s oldest street. According to a SunStar Cebu published in November 2007, the Women’s international League funded 25 Heritage sites on Colon to be marked for remembrance. These markers marked significant entrepreneuring establishments of the early days and traditional homes alike. 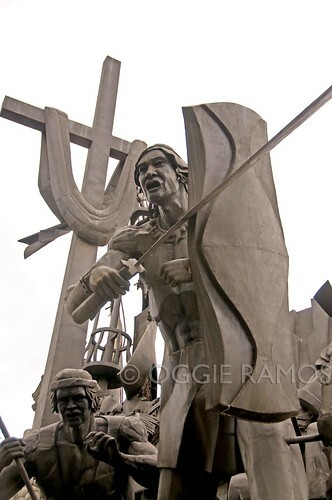 The Lapu-Lapu marker and statue at the Mactan Shrine on Mactan Island commemorate the bravery of local chieftain Lapu-Lapu, who, on April 27, 1521, repulsed the Spanish invaders, killing their leader Ferdinand Magellan, thus becoming the first Filipino to repulse European invaders. He is the city’s well loved hero. Fort San Pedro, built by Miguel Lopez de Legaspi in 1565 and finished in around 200 years later in 1738, is the smallest and oldest fort in the country. With walls 20-feet high and 8-feet thick, the Spaniards used it to repel hostile natives and Muslims; the Japanese, during World War II, used it as a hospital; it was an army camp during the years of liberation; and, in more recent years, a garden club’s experiment (1950) and a zoo (1957), before it has evolved to what it is now, a tourist attraction (P10 entrance fee). All cab drivers know where Fort San Pedro is (Brgy. 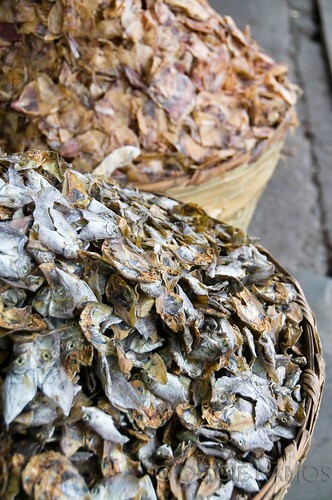 San Roque, Cebu) though it’s best to come right after your visit to Taboan Dried Fish Market (Carbon, Cebu) for danggit or dried fish (P300/kilo) when it’s still not too hot to explore. Driving around the city, there is no escaping the rotunda that is Fuente Osmeña circle, a small park marked by its famous fountain built to commemorate the city’s first waterwork construction (it’s the fountain on the right side of the fifty-peso bill), named to honor the republic’s fourth president. When you see it, you know you’re in Uptown Cebu where many hotels, shops and restaurants are located. One of the four streets Fuente Osmeña opens to is Osmeña Avenue, where the former President Osmeña’s house still stands. 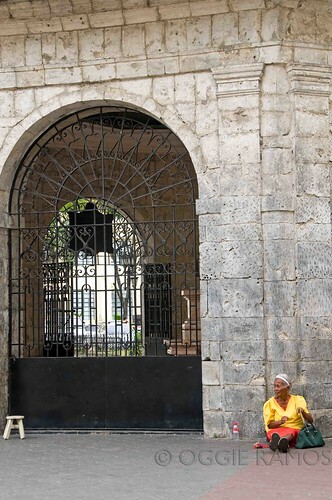 The street ends right smack in front of the provincial capital building, a massive colonial-style structure that is the city’s seat of government. 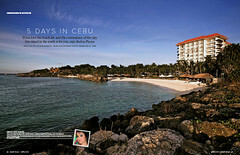 Previous: To read Part 1: Why Go to Cebu?, click here. the first photo here is my favorite in the magazine bai. ive been to this church several times... pero that perspective that you took is the best ive seen so far of this church. What an incredibly beautiful place. I love that first shot, too. You should make travel books/guides. Great pictures & interesting info. The perfect combination. What a travel destination Cebu has become. I remember when I was a child, people only go to Cebu for religious reasons, to pay homage to the Sto. Nino de Cebu. Time has changed and Cebu is reaping the rewards of these changes. 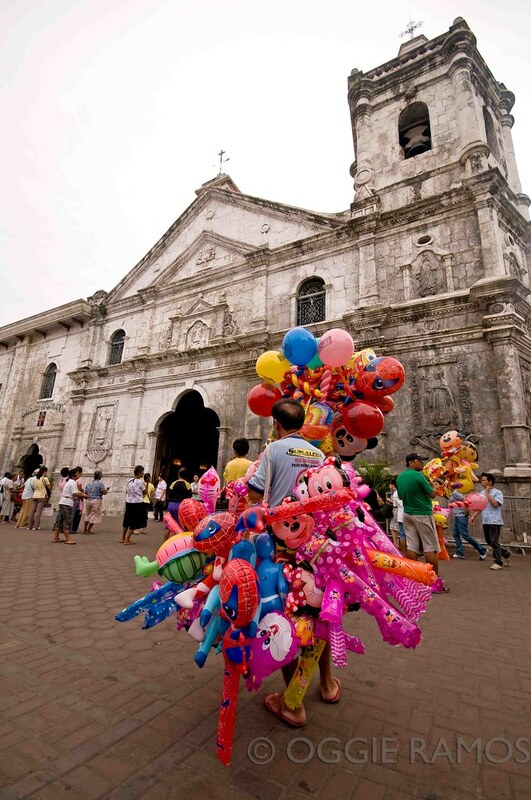 a church and a balloon vendor...my childhood memories consist of this image! Cebu, Magellan fleet's first landing?! Either there's something wrong with the syntax or it's historically amiss. The Armada de Molucca under Captain-General Fernando de Magallanes (a.k.a. Fernao de Magalhaes, Fernam de Magalhaens, Ferdinand Magellan) reached the Philippine archipelago on March 16, 1521. It made its first anchorage on the night of that day at Suluan. The ff. day it made port at Homonhon, where it stayed for a week. The fleet next dropped anchors at Mazaua, the island-port which is celebrated in the Philippines as the site of the Easter Sunday mass of March 31, 1521. The Armada left Mazaua on April 4, making a brief stopoever at Gatighan, a petite isle sandwiched between Bohol and Panaon. In today's map, it's exactly where Limasawa is. Gatighan and Limasawa are one and the same. It's next stop was one of the three Camotes Islands. It reached Cebu on April 7, 1521. Based on the above itinerary, Cebu was in fact the sixth anchorage of Magellan's Armada. Thanks Toni for the link. Hi Faery, I'd like to think that was part of my childhood memories as well. Vicente, first of all, I did not write this piece; I am just publishing it en toto from a feature where I was assigned to shoot the images; two, the article said: "The Spanish expedition... first landed in Cebu in 1521...", it did not say it was the first landing of Magellan's fleet. Nice documentation on historic section of Cebu. Although historians have argued about some many things about Magellan's cross, his expedtion and landing, etc. For all its worth I still feel that Filipinos should make a pilgrimage to Magellan's Cross as tribute to the many beautiful things about our hispanic past. Did you also visit the parian distict? Hi Glen, we weren't able to visit the parian district because of the tightness of the schedule but would love to next time. Thanks for dropping by and leaving a comment. I've never been to Cebu but I would love a chance to see those interesting historical places. I love the first photo. I remember you shared it in plurk.